The plight of Niger's child brides Jump to media player The BBC has been to Niger, which has the highest rate of child marriage in the world with nearly 80% of girls there married by the age of 18. Gaddafi son extradited from Niger Jump to media player The Libyan government says one of the sons of former leader Colonel Muammar Gaddafi, Saadi, has been extradited from Niger and is now in custody in Tripoli. The men selling brides 'to survive' Jump to media player The African Union has launched a campaign to eradicate child marriage from the continent, saying 14 million underage girls a year should be given back their future. Boko Haram 'paying recruits in Niger' Jump to media player Members of a gang in Niger have told the BBC that they collaborated with radical Islamist group Boko Haram in return for money. Police in Niger's capital have fired tear gas at a new protest against French magazine Charlie Hebdo over a cartoon of the Prophet Muhammad. 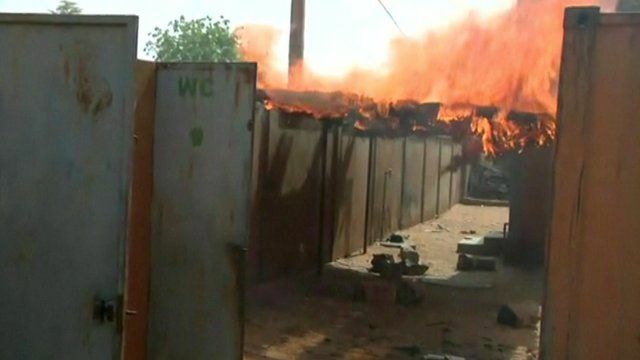 Protesters threw stones at police and burned tyres outside Niamey's grand mosque a day after at least four were killed in the second city of Zinder.